Through the magic of Google Alerts, I recently learned about another new(ish) Virginia brewery. 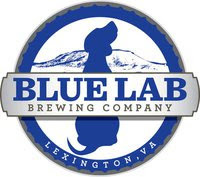 Blue Lab Brewing Company opened in Lexington, VA in November 2010. They describe themselves as "Lexington, VA and Rockbridge County's first and only micro-brewery!" The brewery's web site lists four beers currently on tap; IPA, Amber, Pale Ale, and Bourbon Barrel Stout. The tasting room fills 1 and 2 liter growlers to go. Blue Lab also has a regularly updated Facebook page where you can keep up with current events at the brewery. Even though they've been open for a couple of months, Blue Lab will celebrate their grand opening this week. They will be tapping special beers on Friday and Saturday. In addition, at 2:00PM Saturday, January 29, Lexington Mayor Mimi Elrod will "cut the leash" to officially open Blue Lab Brewing Company.